This energetic little calf just couldn't get enough of us. 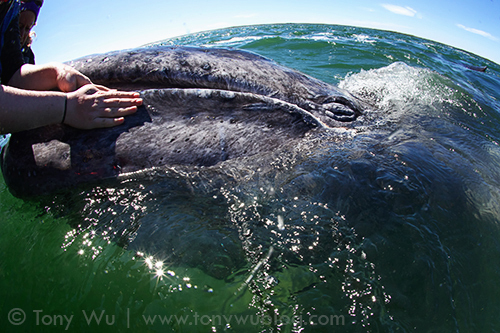 Over and over, the young baleen swam over to our boat, stuck its oddly shaped head out of the water to peek at us, and demanded our full attention. Of course, the tiny tyke couldn't have spent so much time with us had its mother not been extremely patient and cooperative, even coming over herself a few times to give us a good looking over. 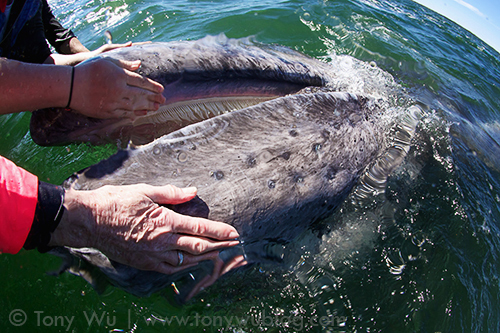 Baby gray whale or attention queen? When you see and experience things like this, it becomes all the more difficult to imagine the deliberate carnage humans once wreaked upon these inquisitive and friendly animals.